Since our beginnings in 1987, HoMedics has created, innovated and refined a remarkable line of personal wellness products to become the recognized #1 Brand in Massage. Our brand is about creating a healthy home environment that helps you relax your body, de-stress, and simplify your life. We are proud to be a leading innovator in massage technology today. The HoMedics Compact Pro Spa Collapsible Footbath with Heat gives your feet a rejuvenating vibration massage. Acu-node surface provides a gentle foot massage as the heat further relaxes your feet. Relax your muscles and soothe your joints by adding Epsom salt to the tub. Submerge your feet and ankles for a warming hydrotherapy massage. The foot pool features heat maintenance technology that helps the water stay warm throughout your entire salon-quality foot massage. Don’t be embarrassed by your feet anymore! Get a spa-quality pedicure with this DIY foot bath. Rub your feet along the nodes on the inside of the basin to get rid of hard calluses. Incorporate a foot massage into your weekly routine to get baby-soft feet. 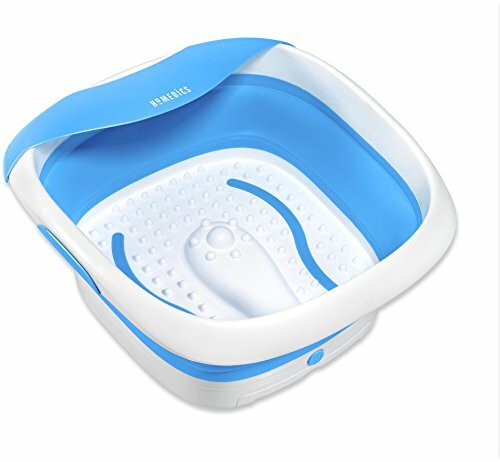 The Compact Pro Spa Collapsible Footbath offers a convenient collapsible tub to store in a small space when not in-use. The built-in anti-collapsible and spill-proof feature ensures a safe and relaxing spa experience anywhere. Your Collapsible Footbath is easy to clean and store. To clean, unplug the unit and empty the water. Allow it to cool before cleaning. Clean only with a soft, damp cloth and mild cleansing agent. To store, unplug the appliance from the outlet and allow to cool and dry. Store in a clean, dry place. To avoid breakage, do not wrap power cord around the unit. Do not hang the unit by the power cord.